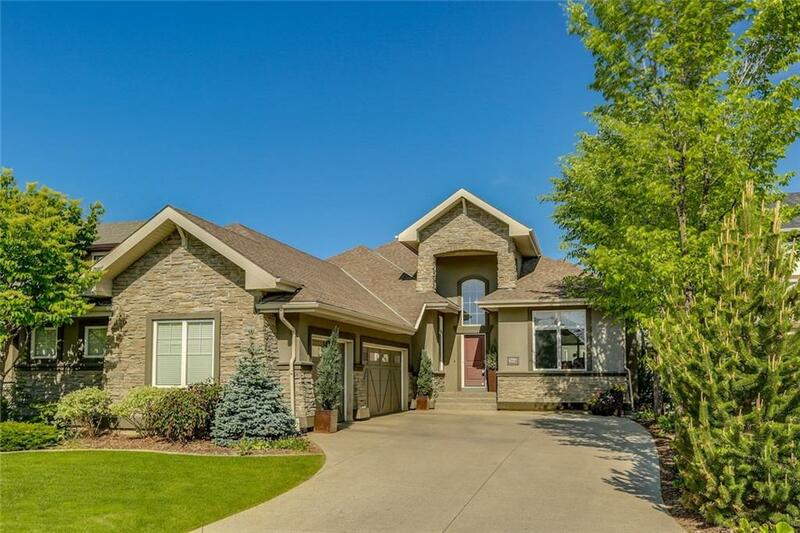 DESCRIPTION Absolutely remarkable lake access home in Chaparral with a total of 3 bedrooms, over 3,800 sq ft of living space & fully developed walk-out basement! The main level presents an open plan, hardwood floors & 10’ ceilings showcasing a den/library with flawless built-in shelving & millwork ( could easily be used as formal dining), living room with fireplace next to the chef-inspired kitchen with coffered ceiling, pot lighting, granite counter tops, huge island/breakfast bar, full height cabinets, walk-in pantry & stainless steel appliances. The elegant master suite is also located on the main level & boasts access to the upper deck, a custom walk-in closet & spa-like 5 piece ensuite with dual vanities, jetted tub & large glass enclosed shower. A 2 piece powder room & mud room complete the main level. The fully developed walk-out basement with in-floor heat features a large recreation/media room complete with access to the lower patio, fireplace, wet bar & pool table. There are also 2 bedrooms (one with a 3 piece ensuite), an office, custom wine room with a unique wrought iron door, laundry room & additional 3 piece bath. Also, enjoy the beautifully landscaped gardens with exterior lighting, built-in LED soffit lighting & back yard with stone patio, lovely water feature & built-in BBQ – a perfect space for outdoor entertaining ($125,000 in value)! A triple attached heated garage & direct access to biking/walking paths complete this stunning home! New Catholic high school opening in Legacy that will be the feeder school for the community just minutes away.